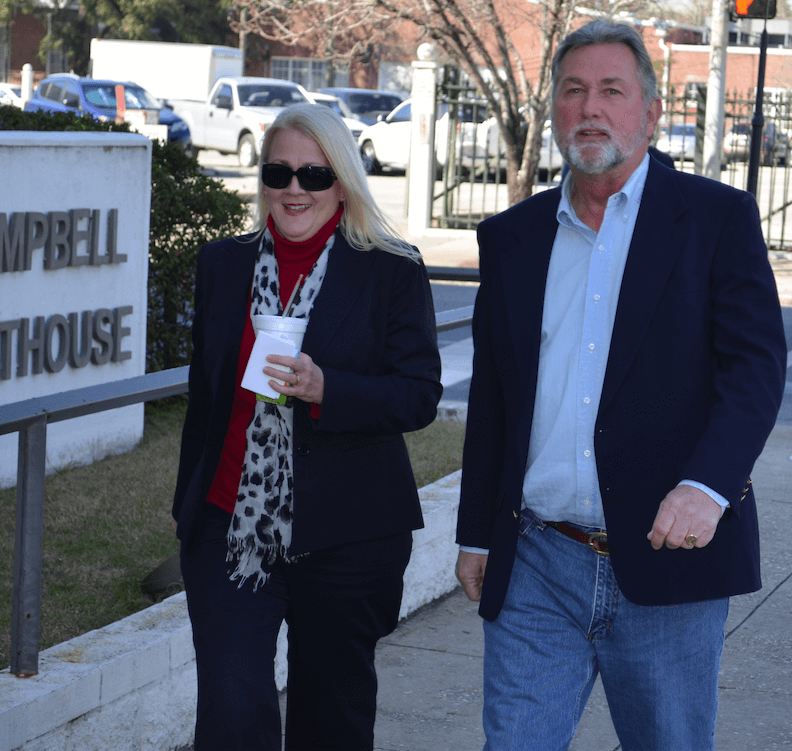 Mobile County License Commissioner Kim Hastie took a step back from a recent newsletter mailed along with tag renewal notices after language in the newsletter drew the scorn of Revenue Commissioner Marilyn Wood. Hastie’s one-page, two-sided newsletter included an endorsement of her year-old plan to combine the duties of the license and revenue commissioners, a plan she says can save the county more than $1 million annually by consolidating duplicative departments, eliminating positions through attrition and cross-training existing employees to perform multiple roles. Last year, Wood announced she would retire as Revenue Commissioner in October 2015. Subsequently, Hastie became an unopposed candidate for Wood’s position, running on a platform that her current role is unnecessary. Calling further attention to a point about “revamping the efficiency of the appraisal appeal,” Wood accused of Hastie of implying that the office of the Revenue Commissioner was mismanaged. 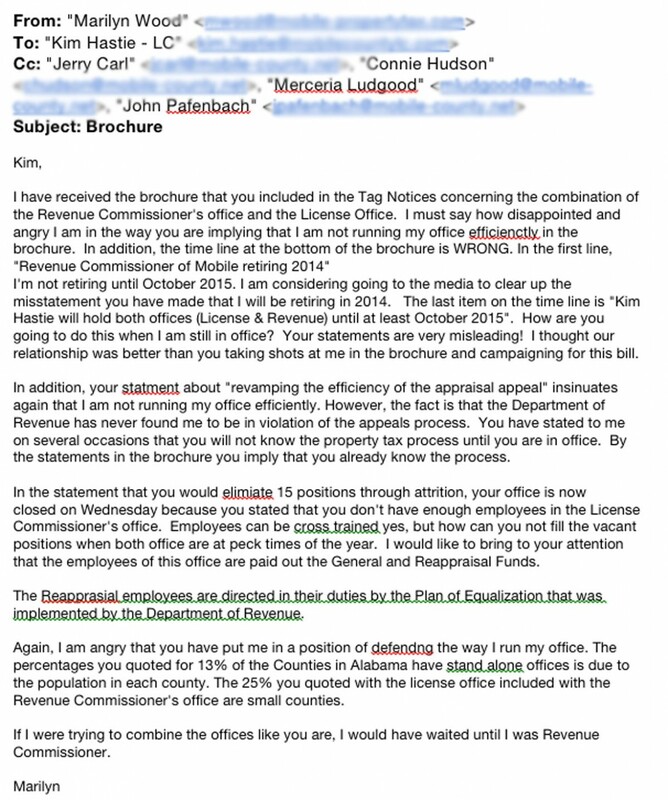 An email from Revenue Commissioner Marilyn Wood to License Commissioner Kim Hastie and the Mobile County Commission disputes claims made in a newsletter Hastie mailed to county residents along with tag renewal notices. Wood said the newsletter was “misleading” and accused Hastie of “taking shots” at her while campaigning for the legislative bill that would be necessary to approve the consolidation. Wood went on to be critical of Hastie’s own management style, which has included keeping the license offices closed every Wednesday. 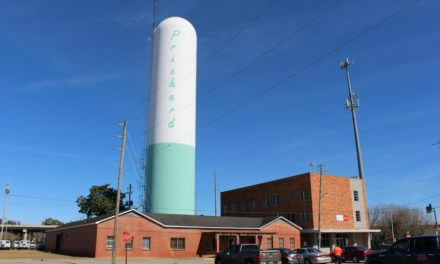 “If I were trying to combine the offices like you are, I would have waited until I was Revenue Commissioner,” Wood concluded. Hastie also noted that she obtained an Attorney General’s opinion and an independent counsel’s opinion about any potential conflicts-of-interest arising from her endorsement of the bill while she simultaneously stands to gain from the consolidation financially. The original bill provided a new salary for the revenue commissioner that would equal to 75 percent of the combined salaries of both the license commissioner and revenue commissioner. A revised version provides for a simple $5,000 raise equal to the salary of Montgomery County’s revenue commissioner, which is about $15,000 more than Hastie earns today as license commissioner. Dismissing the concern, Hastie said the mailer was “just a newsletter” and an extension of the platform she campaigned for as a candidate for revenue commissioner. Hastie said the original bill was contested locally by County Commissioner Jerry Carl, who encouraged the legislature to table it for a later date. Responding, Carl said Hastie overestimated his influence in the legislature, yet he doesn’t deny his fundamental concerns with the bill. Curiously, the original bill also provided for the revenue commissioner to appoint “up to six additional persons to serve as employees of the office in any capacity.” A separate source who expressed concern about the plan suggested that provision alone would eliminate half the savings Hastie is proposing to create. Meanwhile, Hastie said Mobile was one of only nine counties in the state to have separate license and revenue commissions and she hopes to support her cost-saving claims later this month when a study currently being undertaken by local economist Semoon Chang is complete. If the offices do not combine, Gov. 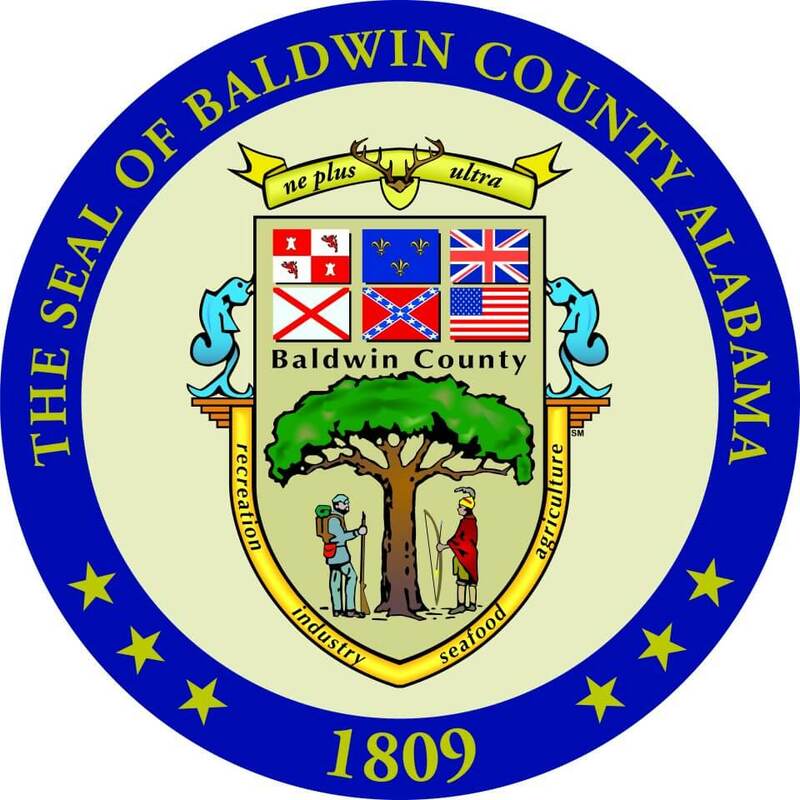 Robert Bentley would appoint a successor to the license commission.